Stay in Stavanger, take day-trips to see the best of the sights, plus good shopping, restaurants and the harbours of the city. Make it a long weekend if you can - arrive Friday and leave Monday, so that you can really enjoy it. You can see a great deal from the car, but if you have energy and decent shoes, the 20 minute scramble up to Månafossen waterfall is worth it. 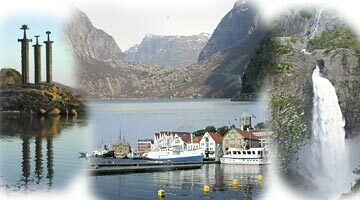 So much to see and do - the coast and beaches; the mountains, waterfalls, or the ferry and road trip through Lysefjord. Gloppedal moraine and Månafossen waterfall are not far away, with the 3 swords monument and many other trips in or close to Stavanger. You could take the airport bus into Stavanger, or get the hire car at the airport - or bring your own car on the ferry. Not sure you want to drive? - then look at the Stavanger city weekend. There are many good hotels in central Stavanger - often with a good choice at weekends. Find a cheap deal, or get something special for a good price. 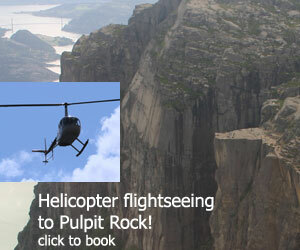 Fly to Stavanger airport (various airlines) and Flybuss to Stavanger centre, or Haugesund airport (Ryanair). Airport buses to Stavanger centre. You could also come on the ferries from England or Denmark.